My son takes photos of the changing panorama before him throughout the day and night looking out from the hills of the Santa Barbara Riviera. Today he posted this beautiful early morning image on Instagram. It inspired this haiku. See a haiku, Translation, inspired by a painting of Egrets by Australian artist Gareth Jones-Roberts. The poem was published in two poetry anthologies. Nathanael also likes that combination so I’m mentioning it. About 6 years earlier, Nathanael had lived in San Leandro as an uchideshi. I had visited him there and witnessed his Sensei demonstrating Aikido, which inspired this tanka, My Son’s Sensei. 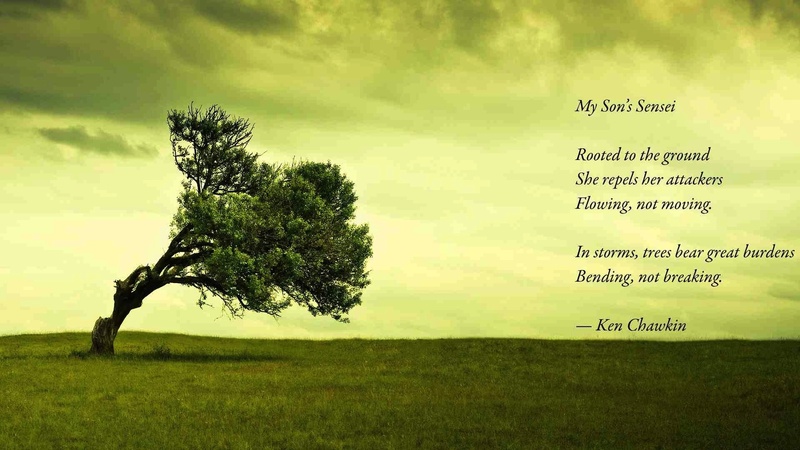 Someone posted it with a tree that reflected the image in the poem. Nathanael happened to be visiting the dojo and sent it to me. Perfect fit! This entry was posted on February 13, 2016 at 12:51 pm and is filed under Films, My poems, Poetry. You can follow any responses to this entry through the RSS 2.0 feed. You can leave a response, or trackback from your own site. Lovely! I’ve seen that view many times when traveling into Santa Barbara. You capture the image perfectly in your haiku. Thank you, Deborah. My son thought so too.